Lockport Wave is an ongoing project featuring a video and text work that attempts to transcend loss of history and the decay of my hometown. The piece is a research project sparked from the closing of the Kenosewun Visitor Centre and Museum, that hosted important information about the animals, land and river and its long history stemming back thousands of years. The town is at risk of becoming a ghost town with other businesses, a church, and waterslide closing. With the absence or removal of physical history, opens the opportunity to rewrite it. This project is both personal and observational, interchanging between personal narrative and known history of a place. Important to this project is the idea of display within the confines of the museum, and how display describes a story or history assembled in fragments, its parts intending to equal a whole, and the connections a viewer must make in order to complete the story within our minds. Work created during Plug In ICA's Summer Institute lead by faculty Chris Kraus and guest faculty Natasha Stagg and Robert Dewhurst. Featuring artists: Kristina Banera, Fabiola Carranza, Maegan Hill-Carroll, Daniel Colussi, Roewan Crowe, Erica Eyres, Esmé Hogeveen, Letch Kinloch, Soyoung Kwon, Chloë Lum, Kegan McFadden, Ralph Pritchard, Jasmine Reimer, Jaquelyn Ross, and Faith Wilson. Installation view of text work for Lockport Wave, 2017 by Kristina Banera. Installation view of works created during the Plug In ICA Summer Institute with Chris Kraus 2017. Shown: Kristina Banera (back left), Chloë Lum (centre left), and Maegan Hill-Carroll (back right). Installation view of works created during the Plug In ICA Summer Institute with Chris Kraus 2017. Shown: Kristina Banera (back right), Fabiola Carranza (back left), Chloë Lum (centre left), and Maegan Hill-Carroll (centre right). Installation view of Lockport Wave, 2017 by Kristina Banera (background) and Fabiola Carranza (foreground) at Plug In ICA Summer Institute with Chris Kraus 2017. 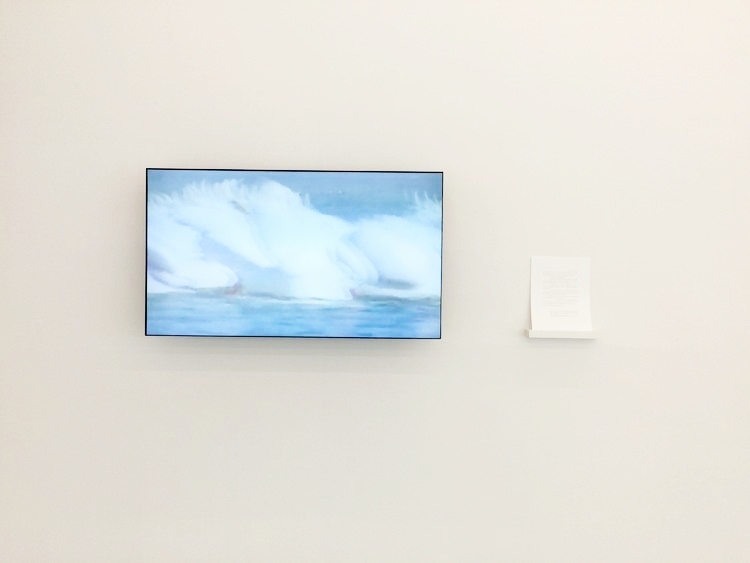 Installation view of Lockport Wave, 2017, video and text by Kristina Banera.